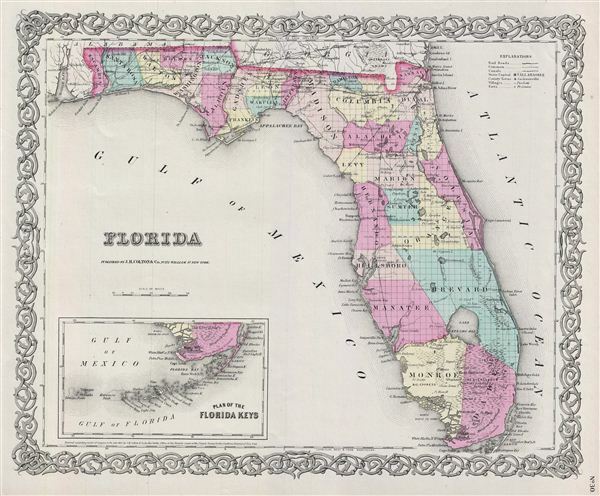 An excellent 1855 first edition example of Colton's map of Florida. Like most of Colton's state maps, this map was derived from an earlier wall map of North America produced by Colton and D. Griffing Johnson. The map covers the entire state of Florida and shows parts of adjacent Georgia and Alabama. An inset in the lower left quadrant details the Florida Keys. In this particular case, Colton has augmented his map with the plat work done by the Florida branch of the U.S. Land Survey. As this map was being drawn, Florida was the seat of the Third Seminole War, the last of the three conflicts between the Seminole Indians and the United States Army. It resulted in most of the Seminole being forcibly removed from Florida, although some remain to this day, staunchly entrenched deep in the everglades. The 'Indian Hunting Grounds' are identified south of the mangrove forests of southern Florida. This map also identifies various forts, rivers, fords, and an assortment of additional topographical details. Map is hand colored in pink, green, yellow and blue pastels to define state and territorial boundaries. Surrounded by Colton's typical spiral motif border. This map would prove to be a prototype for a number of maps to follow by such noted cartographers as Johnson and Gray. It is considered to be among the most desirable of all Colton atlas maps. Dated and copyrighted to J. H. Colton, 1855. Published from Colton's 172 William Street Office in New York City. Issued as page no. 30 in volume 1 of Colton's 1856 Atlas of the World. Rumsey 0149.036 (1856 edition). Phillips (Atlases) 816.